As a Professor of Architecture/Design, I am constantly seeking opportunities in which I can shower accolades upon my students as they venture out into the community to challenge themselves and be expressive in the creative methods they are academically acquiring. This article is about the foresight, forethought, and fortitude of three such students I have the honor to work with. 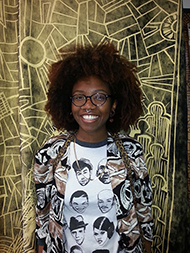 As a Counselor for the Higher Educational Opportunity Program at Pratt Institute getting students to do community work is at times difficult, with the fact that they are so busy with their studies, but Tan Parker (Sophomore Fashion Major), Maireny Mena (Freshmen Fine Arts Painter) and James Antwine (Junior Fine Arts Painter) all aspiring artisans are making the time. 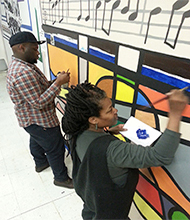 The community project was spired headed by of Tan Parker for a note-worthy organization known as The Noel Pointer Foundation, which began in 1995 with a mission to bring enrichment to children musically, culturally and academically, under the direction of Chinita J. Pointer. 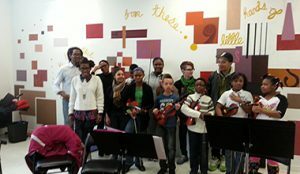 The Noel Pointer School of strings is located in the historic Restoration Plaza complex of restored buildings, an architectural masterpiece of its time and part of a development program for the Bedford Stuyvesant community promoting prosperity in the early 60’s (www.restorationplaza.org/about/history). Tan’s inspiration to collect a number of fellow students to craft visual works of inspiration for the young musicians came after many sessions of assisting with the teaching of violin at the school. The walls were bare she said and the kids sometimes got lost. 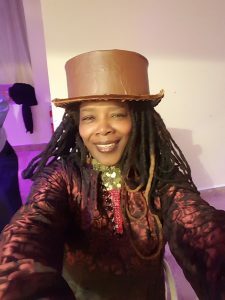 “I needed to find a way to connect them to the task of making music. I believe it was her idea to bring a visual component to the imagery that music makes for so many people. 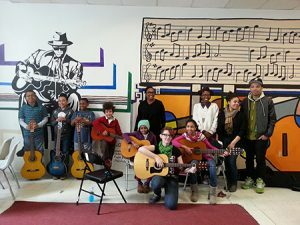 Since the organization provides the youth of the Bedford Stuyvesant, Brooklyn, New York community opportunities to explore beyond their scope of understanding in order to enhance the notion of the arts in early childhood development, she brought a treble cleft and a high ‘C’ note to life. 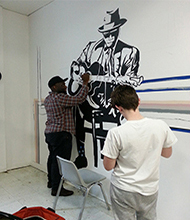 James inspiration for his mural came from his love of BB King and since the room he was assigned is used for the practice of the guitar his choice was appropriate. Maireny’s design had a more whimsical flavor and worked off the notion of perceptions of music that young minds could conjure. Both students made a grand effort to produce visual works of art that inspire and capture the imagination. I am pleased to share this adventure with the community that three students made and look forward to future endeavors by all three.